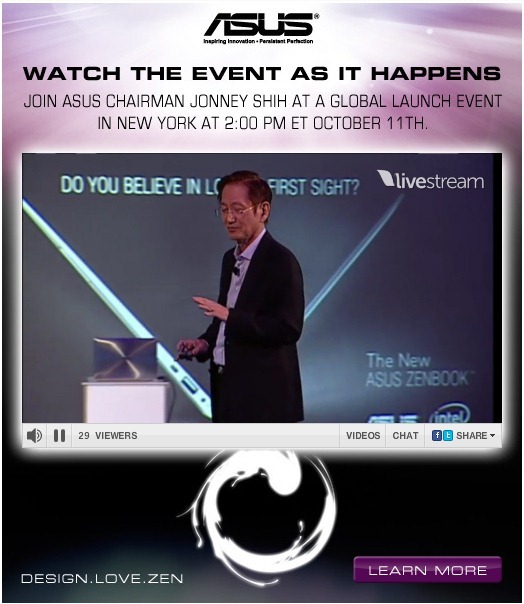 The Asus UX Launch by Johnny Shih has just been concluded and what a treat this new device of theirs is going to be. The Zenbook is a culmination of all the latest computing technology rolled into a package aesthetically compelling because of its metallic sheen and thinness. Highlighted were the 2nd Generation Core i7 processor, USB3, SSD SATA 6GB, and Bang and Olufsen ICEPower Speakers. Comparisons between the "current top seller” (Macbook Air) and the direct competitor (Samsung probably) were presented where no less than 20% advantage was on the side of the Asus ultrabook. Since this is a global launch, there is promise of this device coming into our shores during this 4th quarter as well. Here’s to hoping, especially since a low price was highlighted as well. Very much excited for this one.